Thank you, Cat, for a wonderful year! Because the crocheted blocks were too heavy to stick up on my quilt design wall, I resorted to laying them out on my bed. 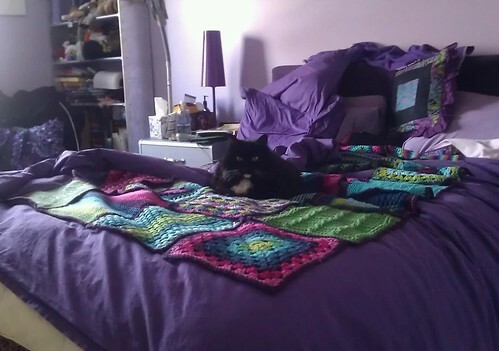 (Or as Wally thinks of it, “My bed which I begrudgingly let the humans use at night.”) I realized with all the variations in pattern and color from block to block I was never going to be 100% satisfied with the layout, but, I did finally settle on one and start sewing the blocks together. I turned to my trusty “Crochet Goodness” Pinterest Board, and actually used some of the great links I’ve been collecting. 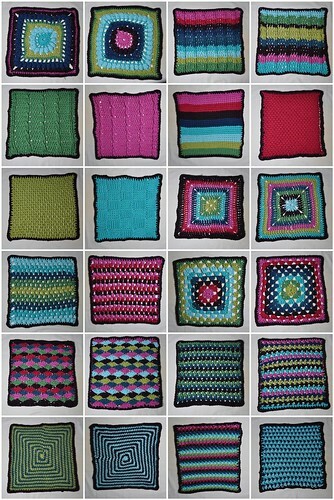 I settled on a method I learned at Craftyminx’s Crochet School– an absolutely amazing free crochet resource. While Cat taught us how to seam blocks together invisibly by sewing them, I went for a faster visible method. I crocheted the blocks together,which resulted in a really delineated outline around each block, in the dark purple yarn. Which you totally cannot see in this fabulous camera phone photo, but I’m going to post it anyway. 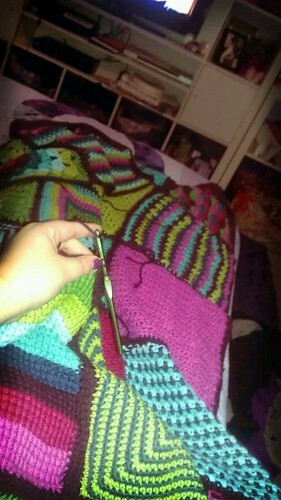 Look, it’s starting to look like a blanket. The squares went together incredibly quickly using this method, and that left me ready for the final outer borders. I went with 1 row of HDC in the dark purple yarn (which is also what every square is bordered in)- that really seems to balance the thick connection between the blocks nicely. 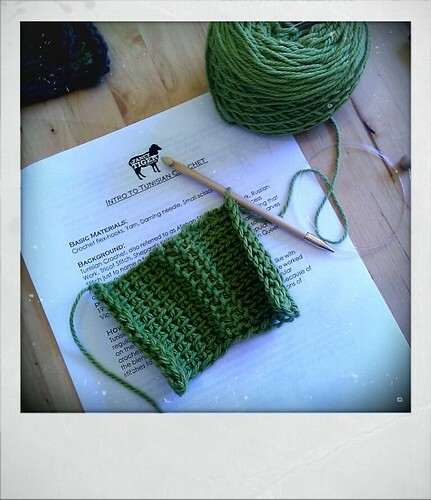 Then 3 rows of HDC in the brighter green yarn, followed by the final row- which is now partway done. 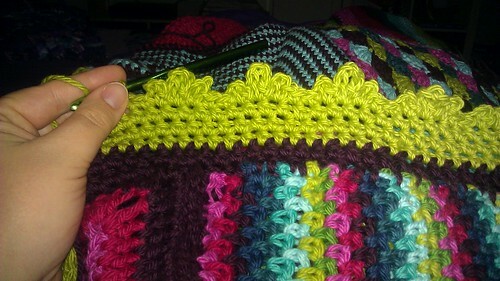 I’m using an edging stitch called “crown picot” that I found through, can you guess? Pinterest! 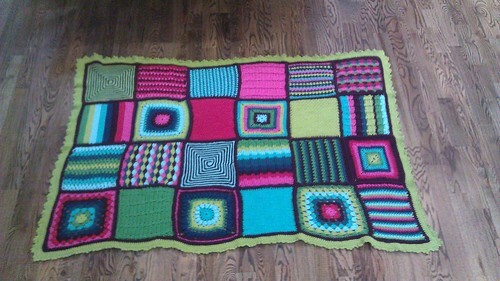 It’s a great tutorial…super easy, and adding a really fun pop to the edge of the blanket. I am so excited to be so close to the end of this year long odyssey. I finally feel like I have a comfortable grasp of crochet. I made new friends through my class. And I’m about to be able to snuggle under the world’s most fabulous blanket. 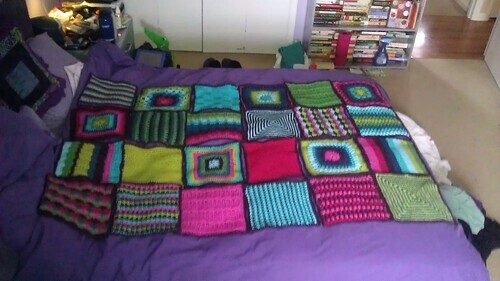 I spent another Sunday with wet wool and handfuls of sharp pins, but… all 24 squares are blocked! 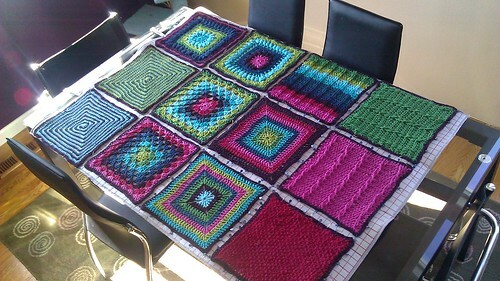 The squares are all dry now, and all approximately the same shape and size. Quite a victory. Here they all are, post blocking. They’re in backwards month order, with December in the top left, down to January in the bottom right. 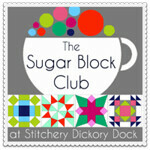 Blocking, how do I love thee? Let me count the ways. Or maybe not, cause that sounds like dull blog fodder. Let’s just say that I never cease to be amazed at the magic that can be worked by some water and some pins… If you looked at the photo mosaic I created showing my afghan blocks to date, you probably noticed how wonky many of them were. So today I broke out the Euclan and my amazing xmas gift from my mom- a block and roll mat. I have some of the interlocking foam squares and they have always worked well, but this mat is a step up! The gridded markings meant that I could easily pin each square to the exact same shape and size, and the design of the mat means I can move it easily if my family has the nerve to want to eat at the dinner table before the squares are completely dry. 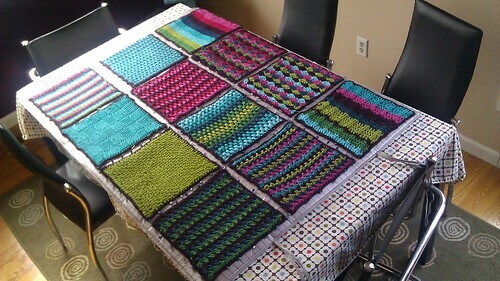 Exactly half of the squares for the 2011 Odyssey Afghan fit on the mat at one time- including one new square. Can you spot it? I’m simply amazed by how nicely the blocks are squaring up- I told myself blocking would work miracles, but I didn’t really believe it… Until today! And I deliberately started with the absolute worst squares. At the end of 2010, I decided to try to learn how to crochet (again.) I dabbled a bit before that, a scarf here, a hat there, but I never felt comfortable with the craft. Certainly not comfortable enough to read a pattern and make something on my own! Pretend they’re all perfectly square, okay? Once I finish the socks currently on my needles, I will tackle those 3 missing blocks, and then move on to sewing the whole mess together. And then a border. And then a year’s work will be done! I spent Saturday in Tunisia. Sort of. 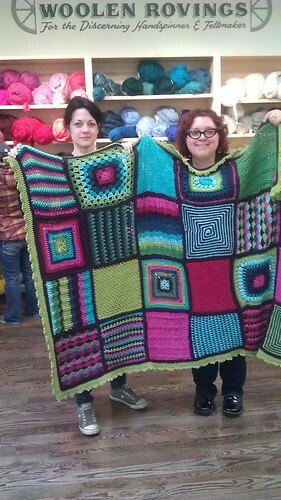 Actually, I spent Saturday at Fancy Tiger for crochet class, and then Sputnik for mimosas and arepas. 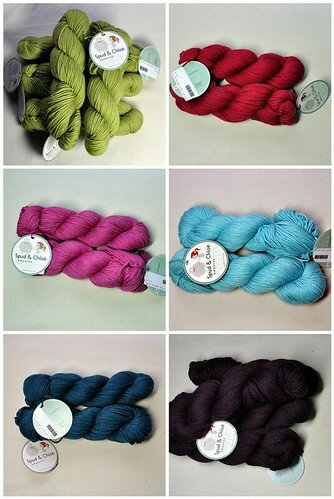 But my yarn did go to Tunisia. Sort of. Okay, what truly happened was that I learned the basics of Tunisian crochet. Super cool! To think, I was afraid of this technique before class. That flex hook freaked me out. But I actually found it easier to pick up than standard crochet, which nearly killed me a few times. Once I get some more cleaning/reorganizing done in the sewing room, I plan to play and play and play with this technique. Visit Samantha's profile on Pinterest.